The sand sculpture definitely got some sun. 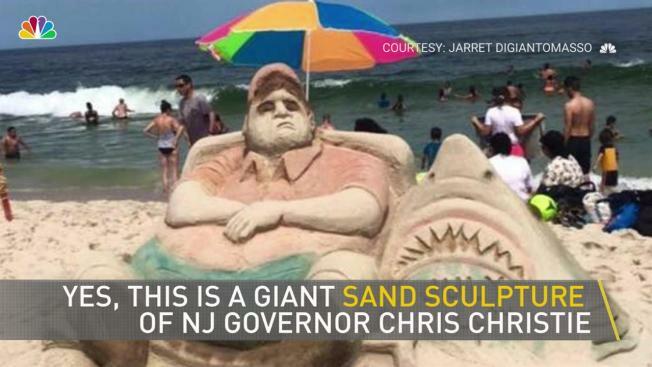 The sculpture was built on a Seaside Heights beach Tuesday, the same day Christie signed his final budget following the bruising three-day state government shutdown that included a viral photo of him lounging on a state beach that was closed to the public because of a budget impasse. Lifeguards said the sculptors behind the piece of art, whose names are only know as Larry and Tom, began their work at 9 a.m. Tuesday and finished by 1 p.m. The lifeguards said that the same two sculptors come to this corner of Seaside Heights every year with their families to make a sand sculpture. Last year, the sculpture honored Sept. 11 victims on the 15-year anniversary of the attacks. The sculpture began to fade as the sunny, summer day dragged on, but the form of Christie — and of a great white shark looking ferocious beside him — could still be made out at sunset. One beachgoer called the sculpture appropriate following widespread outrage during the state shutdown. Sometime before nightfall, someone destroyed the sculpture, replacing it with a smiling face, possibly the head of a starfish. Christie, by his own admission, entered lame-duck territory on Tuesday. The two-term Republican governor signed the $34.7 billion budget and sounded an unapologetic tone over the aerial photos snapped by NJ.com that showed him at the state governor's residence at Island Beach State Park. The pictures sparked a global reaction. Countless memes featuring a Photoshopped cutout of Christie in a beach chair, headlines on international news sites and a full-scale media blitz from Christie's spokesman. "If they had flown that plane over that beach and I was sitting next to a 25-year-old blonde in that beach chair next to me that's a story," he said. "I wasn't sitting next to a 25-year-old blonde. I was sitting next to my wife of 31 years." Christie's job approval in New Jersey has sunk to 15 percent, tumbling after the convictions of three former aides in a scheme to deliberately cause traffic jams at the George Washington Bridge, his failed presidential run and his backing of President Donald Trump. He's become such a political liability in New Jersey that his top deputy, Lt. Gov. Kim Guadagno, running to succeed him, hammered him over the beach photos: "Beyond words," she said. People in New Jersey and beyond seized on what many saw as a let-them-eat-cake gesture by the state's chief executive. "Taxpayers can't use the parks and other public sites they pay for, but he and his family can hang out at a beach that no one else can use?" asked Mary Jackson, a Freehold resident. "Doesn't he realize how that looks, how people will see it as a slap in the face?" 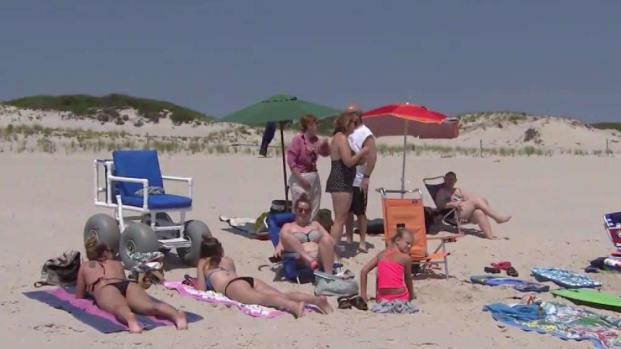 Beaches and parks were back open for the Fourth of July, but many New Jersey residents say damage from the three-day government shutdown is already done. Brian Thompson reports. Christie acknowledged his lame-duck status on Tuesday after the budget signing but predicted that if Guadagno wins he still might have some influence with lawmakers — but less if Democrat Phil Murphy wins. The Legislature is expected to leave Trenton to campaign since all 120 seats are up this year. Christie denied the beach photos played a role in how he negotiated with lawmakers and said it was "the pressure of a shutdown" that contributed to the budget resolution. He also has said he only worries about polls when he's running for office — and he's not. But experts said they think the pictures all but did him in. "The photos are likely the nails in Christie's political coffin that drive his approval ratings into the single digits," Montclair State University political science professor Brigid Harrison said. The deal Christie struck late Monday with Democratic Senate President Steve Sweeney and Democratic Assembly Speaker Vincent Prieto calls for a $34.7 billion budget that includes more than $300 million in Democratic spending priorities and is part of an agreement to overhaul the state's largest health insurer, Horizon Blue Cross Blue Shield. The Horizon legislation calls for annual audits of the nonprofit's reserve level, sets a range for reserves and requires excess to be spent on policyholders. The budget stalemate centered on Christie's desire for legislation to overhaul Horizon, but the deal includes none of the initial use of Horizon's surplus for opioid treatment that he set out to get in February. Without a budget, state parks were shut down along with other nonessential state services, including state courts and the motor vehicle offices where people go to get driver's licenses. Tens of thousands of state workers were furloughed. Christie said he requested to give state workers a paid holiday on Tuesday and would discuss back pay with lawmakers.